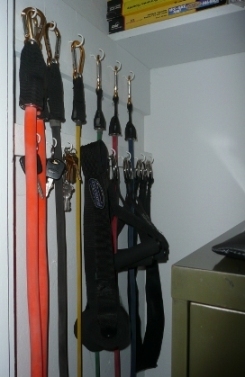 The Gray Iron Fitness Newsletter, Issue #51- A No-Frills No-Excuses Home Gym. In today's Oct. 1, 2010 newsletter . . . 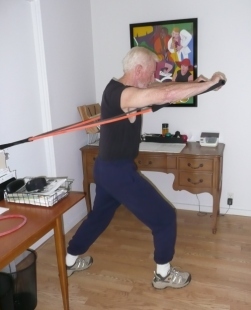 In the last newsletter (Sept. 15, 2010) I showed examples of three seniors' home gyms, and promised to this week show a very inexpensive home gym option requiring minimal equipment and a small space. That information follows. I have a small home office where I do my writing. It was converted from a guest bedroom to a convenient work space. On days when I don’t want to go to a gym, it transforms in a flash to a workout room. Hung neatly in my storage closet and next to a metal filing cabinet are sets of resistance bands and a rolled up yoga mat. Required time to convert my office to an exercise room: less than one minute. So short of illness, there’s never an excuse for missing a workout. I’m not saying people who enjoy the camaraderie of a gym or health club should give up their memberships. I’ve belonged to gyms for years. On the other hand, in the time it takes me just to drive to the gym I can be half-way through my workout at home. So I workout here, take a shower, and I’m done. No highway traffic, no searching for a parking place, no hassle. You may be thinking that’s all well and good. But are those resistance bands really that effective? Without hesitation, I can say that they are. In fact, they are very effective. I’m not running down free weights. 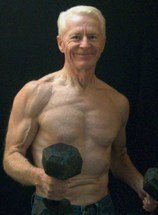 I use free weights, and, as I said, I’ve belonged to gyms for years. Nonetheless, resistance bands are a great training option. For around $50 to $100 you can have a total home workout system that can go with you when you travel. When my wife and I went away for a few days recently I brought along the bands in a small (13 x 13 inch) satchel that came with the set, and we never missed a workout. You can take them anywhere. Another huge plus is that I have never — and I mean never — developed any tendinitis while using resistance bands. Does that mean it can’t happen? Of course not. It is possible to develop tendinitis while using any kind of exercise equipment, or even bodyweight exercises alone. Still, exercise bands are easier on tendons and ligaments than weights, no question about it. And exercising muscle without beating-up your joints becomes more important as you grow older. Okay, so let's say you’ve been working out across town at the Big Iron Gym. You’re a senior but still hanging in there with the young bucks. Maybe you have a notion that resistance bands are kind of wimpy. You’ve seen those skinny little elastic bands lying around the aerobics’ room. Erase that image. The bands I’m talking about are the kind the Dallas Cowboys football team use. Or ask Terrell Owens about resistance bands. They’re his primary off-the-field workout. (Even if you’re not a Cowboys fan or you have issues with Terrell Owens — wimps they are not!) Many top amateur and professional athletes use them. So don’t be fooled. There are plenty of companies selling resistance bands. I bought mine from one of my advertisers, the BodyLastics company. You’ve probably seen the ads on my website (like the one below). Complete sets come with easy level resistance bands to strongman thickness and various levels in between. Their products are of high quality, competitively priced, and I have found the people to be honest and reliable. I tried them, I liked them, and I use them. If you're cramped for space, short on time, or working within a limited budget, a good set of resistance bands may be just the training solution you're looking for. Imagine a friend, a loved one - or anyone - suddenly collapsing, perhaps gasping for air or going immediately unconscious. Could you help? Would you know what to do? Every three days, more Americans die from sudden cardiac arrest than the number who died in the 9-11 attacks. Now imagine how good it would feel if you were able to apply a simple technique and save the life of a sudden cardio arrest victim. It isn't complicated. The older method of CPR, which combined mouth-to-mouth breaths with chest compressions, has been found to be less effective than continuous chest compressions alone. It really is simple. You can learn how to do them in a six minute video from the University of Arizona School Medicine. You could save a life. Watch the video and know what action to take in an emergency. Some things in life are more valuable than a 300 pound bench press. Saving a life is one of them. Invest six minutes and you will know how. It is a heroic thing to do. CPR video here. You've probably heard about the tremendous benefits of weight training and how you can retain -- or even reclaim -- the attributes of youth . . . Discover the way with . . .
Like newspapers, magazines and television, the newsletter and web site contain advertising and marketing links. I receive payment for ads or commissions when people buy advertised products or services. The newsletter and web site provide information to help users establish and maintain a fitness lifestyle. But fitness information is not the same as fitness advice, which is the application of exercise and dietary practices to an individual's specific circumstances. Therefore, always consult with your physician for assurance that fitness information, and your interpretation of it, is appropriate for you. Your comments and questions are always appreciated. © Copyright 2008-2012 Senior-Exercise-Central.com. All rights reserved.